I have been wanting to repot this jade plant that I received from a couple I used to go to church with in Topeka. It started out very small and got very large. The original plant is in the bottom right photo. When I first got it, it was about the size of the top right photo. All of these plants have been on one pot for the past year kind of growing on top of each other. I’ve wanted to separate them for some time, and today I got the motivation and time to do it. 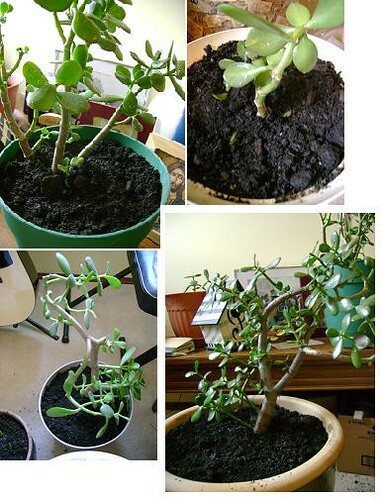 You’ll also notice in the top left of the bottom right photo is another jade plant that I took as a transplant from the rest of the plants earlier. It’s amazing that sometimes even new plants can grow from just one leaf! I’m trying that with another pot as well. The plant has been laying on its side for a while, which is why, you’ll notice, all the leaves are pointing sideways instead of up.